Sailing along through the Micronesian Islands of the South Pacific, I got a nasty awakening this morning as I was rolled out of my bunk without warning. Fortunately, I landed in the stack below me but the boat was tipped over at such an angle that if you didn't know what was going on you might think the boat was about to capsize. 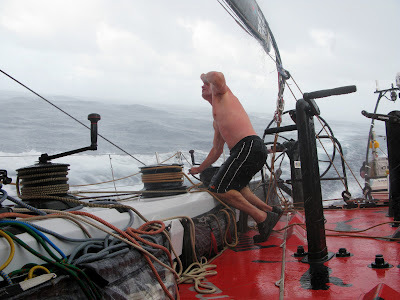 We'd been hit by another line squall. They appear to be quite prevalent in this part of the world and seem to have some teeth as well. 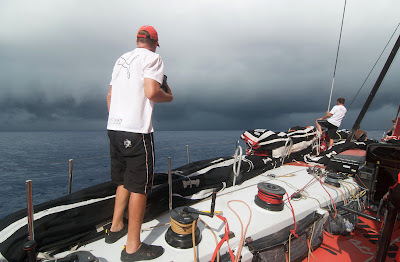 Once the call has been made that we are about to get hit the crew has to react quickly to make the boat safe - wind speeds in a squall can easily double or increase by 20 knots. I could hear the guys on deck running around as they got the big jib down and put up a smaller sail, then a minute later the reef starts to go in. I can feel the boat accelerating and then go quiet as the helmsman turns downwind so that the guys can make the maneuver safely. The squall has generated a sloppy wave pattern and boat starts to crash and bump because the waves are disorganized and random. This particular squall was a real beauty and lasted about two hours. The first indication that you are going to get nailed by a line squall will be a general darkening and thickening of the clouds to weather, therefore if you're reaching and you see some activity at about 45 degrees off the windward bow, you need to start getting prepared. The photograph of Ken looking out with the binoculars illustrates pretty, well how a line squall appears about eight minutes out. The leading edge of the squall comes with a pretty high probability of a significant wind-shift. You will observe high black clouds above you and light rain will start to fall. This lasts for about five minutes and is generally followed by a short pause in the rain, which may be accompanied by possible clearing of the clouds. This break will only be for a few minutes before the large drops start to fall from the puffy nimbus clouds that make up the body of the squall. Once in the squall, the rain will be torrential and I mean torrential. It's really quite fun. Because the water is so cool and clean it provides a great chance for a shower and generally speaking the on-deck watch has to work around the off watch guys streaming out of the hatch clutching shower gel.